People try to turn SEO into rocket science. It’s not. We use the simple SEO Strategy outlined below to help our clients increase traffic and sales and we can do the same for your company. Review our case studies or contact us to get started. 1 – An SEO Friendly Website. 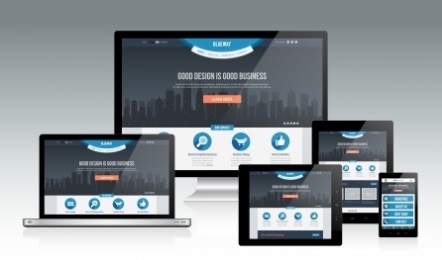 Your website is the foundation for everything you do online. If you want to give your business the best possible chance of ranking well in Google, begin with a brand new custom-coded WordPress website. We chose WordPress because it’s the most SEO-friendly platform around. In fact, it’s become the industry standard for web developers – it is widely supported and for us, it’s the only content management system we support. All our successful client SEO campaigns begin with a quality WordPress website, and you should, too. 2 – Optimized Content. Content is king when it comes to Google, so what you want to do is create content that targets the words and phrases people are using to find you. In addition to having an excellent home page that targets what your business is, we recommend creating quality, well optimized pages that target each and every product or service your company sells. When that’s done, use your blog to target long tail keywords people search for. We’ve seen time and again with our clients – the more great content you have on your site, the more traffic and leads you’re going to generate. 3 – Link Building. Links that point to your website from other sites on the web are what help build your site’s Domain Authority. Domain authority is measured from 1-100 with 100 being the most authoritative. Generally speaking, websites with higher domain authority rank higher in Google. Each month, we build links for our clients and over time, all of these links help build your website to be stronger than your competitors. This is what helps set your website apart and over time, as develop authority, your website will be worth more because it will rank better and generate more new customers. So, there you have it: At the end of the day, we consider ourselves to be more of a digital marketing agency than we do an SEO agency. We don’t sit around tweaking titles and H tags all day long. Our SEO strategy is more of a marketing strategy. We’d rather invest time and resources into publishing great content to your website every month and build authority for your site using link building. We’ve found that if you follow this simple strategy of CONTENT + LINK BUILDING month after month, you will begin to move ahead of your competitors and capture the traffic and new leads they used to get. If you want to develop a long term relationship with someone you can trust, call us. We’d love to help you. Here are a few case studies from clients we’ve been working with for a long time. This screenshot is from Google Analytics for one of our business to business clients, who is an aluminum distributor. The graph represents organic traffic from Google. Notice the increase from 655 sessions in April 2014 to 4,828 sessions in September 2016. In those 29 months, they’ve seen over 7x increase in traffic. 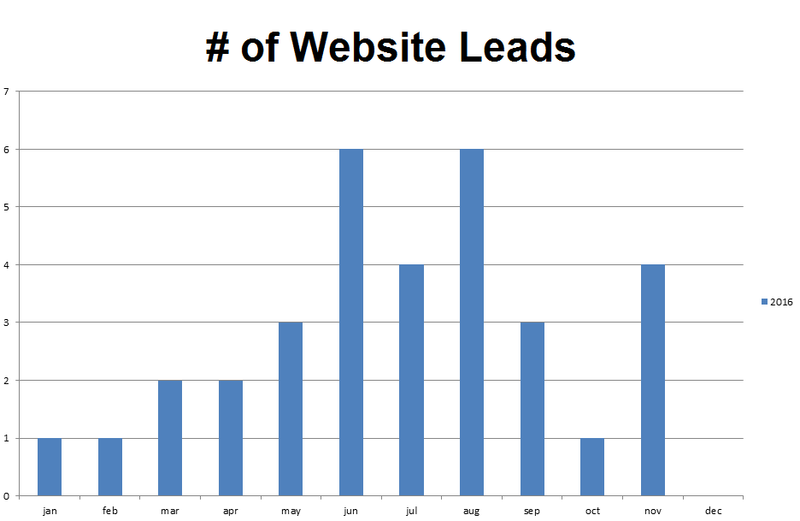 This next image shows the number of leads they’ve gotten each month from people requesting to be contacted via a lead form on their website. 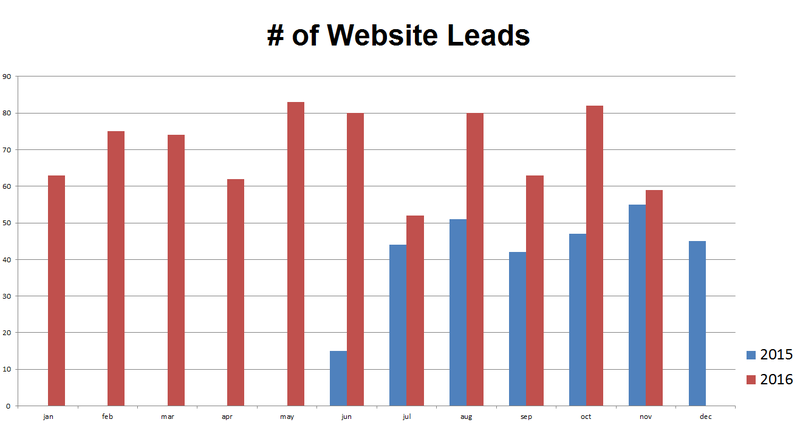 Notice how the # of leads in 2016 (red bar) is steadily higher than the # of leads in 2015. It has taken a few years to build this pattern of SEO success, but we are on the right track and hope to continue the trend in the future. Custom-coded SEO friendly website shows all their products, industries, and categories. Our second SEO case study is from a chiropractor client who runs a local practice with one location. You can see how Google organic traffic is starting to grow in year two: 16 months into our SEO campaign, our client is getting more than 4x the traffic he got when we began handling his digital marketing and search engine optimization. In general, the number of website leads from Google is trending upward. It’s important to note that since this client is a chiropractor, most people pick up the phone and call, since their situation is usually urgent and they want to make an appointment. But the # of leads shown here gives you an idea that our SEO campaign is beginning to work. We provide our clients with two key metrics – organic traffic from Google, as measured from Google Analytics – and # of lead forms completed at their website. The real measure of success, of course, is sales, and since our clients continue to grow their businesses each year, they continue to work with us. We would love to help you get similar results for your company. Call and speak with us.